Finding investors for your art business doesn't need to fill you with horror. It can be beneficial to your businesses finances to have an investor, or investors. As long as you can provide as much financial information, along with a full, detailed, well researched business plan you should be able to attract some kind of investment. The obvious choice for investment is the bank, but with them less like to invest in small companies with no real background or proven track record the chances are slim that you will attract any of them to invest, unless you have secured larger orders and have proof of this. Family are also good sources of investment, but they are probably not the best place to go. Family will often need their investment back at short notice and are not likely to want to commit to a contracted timeframe. 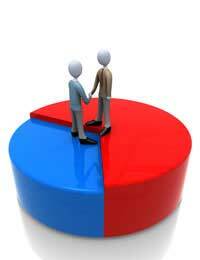 Galleries owners are also a good source to approach when looking for financial partners. They know the business and are often avid art collectors, however, they tend not to invest in one business and offer to offer you gallery space rather than financial help. The people you need are businesspeople, the ones that know how to help you grow the business and take it forward, as well as injecting cash into it – under contract. The only downside to this is that you will have to hand over part of your business in return for their money. We have all seen Dragon's Den and how the Dragon's insist in owning up to 50% of a company for their cash injections. However, when you weigh up the advantages of having a business partner that knows about business, it's a sound idea to take their offer and hand over the share of your company. Many artists have no idea about running a business and having a partner who does makes financial sense. Approach local business advisory services, such as Business Link and ask them about finding investment. Your local business advisor, normally accessible through the jobcentre, should also be able to point you in the right direction. There are numerous ways of finding investment, even down to doing simple things like advertising in your local paper for a business partner, just be sure to include that you are looking for financial input in return for a percentage of your art business. The internet can't be discounted when looking for investors, either. There are websites where you can go and register to let people know what you are looking for. This way you are more likely to attract global investors, which, if handled correctly, could catapult your business into going international almost overnight, just be prepared for the currency differences. You are not likely to attract investors if you have no business to interest them in. You need to have a clear idea of where your business is going, how much money you have invested and how it was spent. They will also want sales forecasts and cash flow statements, not to mention the business plan before they will even begin to take you seriously.